GOES 8 weather satellite’s image of Hurricane Mitch, October 26, 1998. Coral reefs are vulnerable to hurricane damage. Reefs are now, and always have been, vulnerable to destructive natural events. In fact, weather-related damage occurs frequently. The large, powerful waves that accompany hurricanes and cyclones can break apart or flatten large coral heads and scatter fragments (Barnes & Hughes, 1999; Jones & Endean, 1976). Branching corals, which tend to be more delicate and become increasingly unstable as they grow, are more vulnerable to storm damage than massive forms such as brain coral or the stouter branching forms. A single storm seldom kills off an entire colony, but slow-growing corals may be overgrown by algae before they can recover—a circumstance that may be aggravated by increased nutrient output from runoff and sedimentation (UVI, 2001). Reefs are dependent on specific environmental conditions. Most require a specific water temperature range (23 to 29 °C) for optimal growth. Some can tolerate higher temperatures, but only for limited periods of time. In addition, specific levels of salinity (32 to 42 parts per thousand), water clarity and light levels generally must be consistent throughout the year for corals to grow optimally. Many scientists, however, believe that impacts associated with global climate change, such as increased concentrations of carbon dioxide and other greenhouse gases, are disrupting the delicate balance of the ocean’s chemistry. Warming trends can elevate seawater temperatures and levels as well, rendering conditions unfit for coral survival (NMFS, 2001). Corals are susceptible to exposure during periods of low tide. They may become so stressed that they eject their zooxanthellae, bleach and possibly die. Tidal emersions—low-tide occurrences that leave coral heads exposed—also can damage shallow-water reefs, particularly along the reef flat and on the reef crest. The amount of damage incurred depends on the time of day and the weather conditions that coincide with low tide. Chronic emersions that occur during the day, when heat and sun are strongest, generally are more damaging to coral systems than other emersion events. During the day, corals are exposed to the most ultraviolet radiation, which can overheat and dry out the coral. Corals may become so stressed that they begin to expel their symbiotic zooxanthellae—a circumstance that can lead to a phenomenon known as “coral bleaching” (Barnes & Hughes, 1999). Prolonged exposure to cold and rainy weather also can damage corals (Barnes & Hughes, 1999). In some cases, corals exposed to such conditions become covered with a grayish fuzz that consists primarily of decomposing coral tissue (Jones & Endean, 1976). In addition, natural phenomena, such as the El Niño weather pattern, can have lasting, and sometimes devastating, effects on coral reefs. During an El Niño season, easterly trade winds weaken, which depresses normal oceanic upwelling processes and affects the climate. Rainfall increases along the eastern Pacific, while Indonesia and Australia experience drought conditions. El Niño can lead to increased sea-surface temperatures, decreased sea level, and altered salinity due to excessive rainfall (Forrester, 1997). During the 1997-1998 El Niño season, extensive and severe coral reef bleaching occurred, especially in the Indo-Pacific region, and the Caribbean. Approximately 70 to 80 percent of all shallow-water corals were killed on many Indo-Pacific reefs (NMFS, 2001). During the same year, coral reefs in the Florida Keys experienced bleaching events ranging from mild to severe (NMS, 2001). Massive coral infected with Black Band disease. The white area is the exposed coral skeleton where the living coral tissues have died. Coral reefs also are vulnerable to disease outbreaks. The onset of disease generally is a response to biotic and/or abiotic stresses. Biotic stress factors include the presence of bacteria, fungi, protozoa and possibly viruses. Abiotic stress factors—physical and chemical changes—include increased sea-surface temperatures, ultraviolet radiation, and nutrient input or other pollutants (NMFS, 2001). According to many coral researchers, rates of disease outbreaks are increasing and affecting more reef species (NMFS, 2001). Scientists believe that the presence of certain stress factors can create environmental conditions favorable to disease microbes, while rendering corals weaker and more vulnerable to colonization. Currently, the most common diseases affecting coral are white-band disease, black-band disease, white plague and yellow-blotch disease (NMFS, 2001). Damage caused by a single feeding parrotfish. The polyps have been killed and eaten, and the underlying skeleton is exposed. The polyps adjacent to the exposed skeleton are vulnerable to algal colonization. Finally, corals are vulnerable to predation. Numerous species, including parrotfish, polychaetes, barnacles, crabs and gastropods, prey on coral polyps, destroying the substrate in the process and preventing other corals from settling (Jones & Endean, 1976). Recent outbreaks of one predator, the crown-of-thorns starfish (Acanthaster planci), devastated reef systems in Guam, along Australia’s Great Barrier Reef and others. A. planci is a multirayed starfish covered with long, sharp, mildly venomous spines. A full-grown specimen ranges in size from .25 to .5 m in diameter, and feeds by attaching itself to a coral head, inverting its stomach, and digesting the underlying coral tissue. When it detaches, it leaves behind a large, white, dead skeletal patch that is rapidly colonized by filamentous algae. Colonies of calcareous algae and soft corals soon follow (Barnes & Hughes, 1999). The crown-of-thorns sea star (A. planci) consumes and ingests corals’ soft tissues as it slowly craws over the reef. In high concentrations, these organisms can quickly decimate a reef system, leaving it a barren wasteland. When A. planci infestations occur at low densities, coral colonies can recover relatively easily. However, heavy infestations, as great as 15 adults per square meter, can devastate a coral colony (Barnes, 1987). In 1978 and 1979, for example, a massive A. planci outbreak devastated as much as 90 percent of the coral reefs of Fagatele Bay in American Samoa (NMS, 2001). Scientists are unsure of the causes for heavy outbreaks, but evidence suggests that the removal of the starfish’s predators in many areas, particularly the overfishing of giant triton and other predator fish, has allowed starfish populations to boom (Barnes & Hughes, 1999; Jones & Endean, 1976). Other evidence suggests that larval periods of high population outbreaks may coincide with plankton blooms (Barnes, 1987). IIn addition to natural threats, human activities pose grave threats to the viability of coral reefs. One of the most significant threats to reefs is pollution, a term used to describe numerous types of human-induced marine discharges. Marine debris like this discarded plastic bag are ubiquitous near heavily populated near-shore areas. 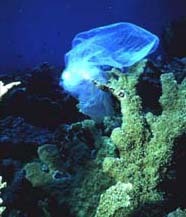 Plastic bags can quickly kill corals by surrounding and “suffocating” them. Excessive runoff, sedimentation, and pollutant discharges can result from dredging and shoreline modifications, coastal development activities, agricultural and deforestation activities, and sewage treatment plant operations. In addition, hot-water discharges from water treatment plants and large power plants can significantly alter the water chemistry in coastal areas (UVI, 2001). When pollutants are discharged, nutrient levels (nitrates and phophates) in the water can increase. This can lead to an excessively nutrient-rich environment (eutrophic), which encourages algae blooms and the growth of other organisms that can stifle corals or outcompete them for space (Jones & Endean, 1976). In addition, direct sedimentation can smother a shoreline reef, or it may increase the water’s turbidity, which, in turn, obscures the light on which corals thrive. Light deprivation ultimately will starve a coral, which is dependent on its symbiotic algae (zooxanthellae) to generate food photosynthetically (UVI, 2001; Bryant et al., 1998). In many other areas, coral reef habitats are overfished and/or overexploited for recreational and commercial purposes (UVI, 2001). Coral heads and brightly colored reef fishes are collected for the growing aquarium and jewelry trade. Reef fishes also are collected for food. Careless or untrained divers often can trample fragile corals. In addition, their fishing techniques can be destructive not only to fish but to the coral habitat. Blast fishing, for example, in which dynamite or other heavy explosives are detonated to stun fish for easy capture. This fishing method cracks coral heads apart and stresses nearby coral colonies so much that they expel their symbiotic algae. As a result, large sections of reefs can be destroyed. Destructive fishing practices such as the use of cyanide, blast fishing, and deep-water trawling destroy both fish and reef habitat. Cyanide fishing, which involves spraying or dumping cyanide onto reefs to stun and capture live fish, also kills coral polyps, and degrades the reef habitat. In addition, one-third to one-half of all fish collected this way die soon after they are removed—either sometime along the trade process or, ultimately, in captivity (NMFS, 2001). According to some estimates, more than 40 countries are affected by blast fishing, and more than 15 countries have reported cyanide fishing activities (ICRI, 1995). Other damaging fishing techniques include deep-water trawling, which involves dragging a fishing net along the sea bottom, and muro-ami netting, in which reefs are pounded with weighted bags to startle fish out of crevices (Bryant et al., 1998). Often, fishing nets left as debris. Live corals become entangled in nets and in areas of wave disturbance are torn away from their bases (Coles, 1996). Moreover, the impact of s dropped from fishing vessels onto reefs can break and destroy coral colonies (Bryant et al., 1998). Finally, coral reefs are directly impacted by marine-based pollution. Leaking fuels, anti-fouling paints and coatings, and other chemicals can leach into the water, adversely affecting corals and other species (UVI, 2001). Petroleum spills also are a concern. Little evidence suggests that petroleum spills directly affect corals because the oil usually stays near the surface of the water, and much of its volume evaporates into the atmosphere within days. However, the timing of a spill is crucial. Corals that are spawning at the time of an oil spill can be damaged because the eggs and sperm, which are released into the water at very precise times, remain at shallow water depths for various times before they settle. Thus, in addition to compromising water quality, oil pollution can disrupt the long-term viability and reproductive success of corals, rendering them more vulnerable to other types of disturbances (Bryant et al., 1998). As coastal populations swell and marine resources continue to be exploited, coral reefs face an uncertain future. An International Coral Reef Initiative has been established to address and mediate the hazards that threaten the survival of coral reef ecosystems. Barnes, R. 1987. Invertebrate Zoology. Fort Worth, TX: Harcourt Brace Jovanovich College Publishers. p. 783. Barnes, R. and R. Hughes. 1999. An Introduction to Marine Ecology. Oxford, UK: Blackwell Science Ltd. pp. 131-133. Bryant, D., L. Burke, J. McManus, and M. Spalding. 1998. Reefs at Risk: A Map-based Indicator of Threats to the World’s Coral Reefs. World Resources Institute. pp. 11-15. Coral Reef Task Force (CRTF). 2000. The National Action Plan to Conserve Coral Reefs. Washington, DC: CRTF. p. 3. Forrester, A. 1997. The Effects of El Niño on Marine Life. Cambridge Scientific Abstracts Web site. http://www.csa.com/discoveryguides/archives/elnino.php. Jones, O. and R. Endean. 1976. Biology and Geology of Coral Reefs, vols. 2 & 3. New York: Academic Press Inc. pp. 216-250. National Marine Fisheries Service (NMFS). 2001. NMFS Office of Protected Resources Web site.